We went out for lunch today, we often eat out weekends, in fact, we eat out every weekend at some point, at least once! I know, terrible isn’t it! Gives my microwave a well earned rest though, no really, it does! 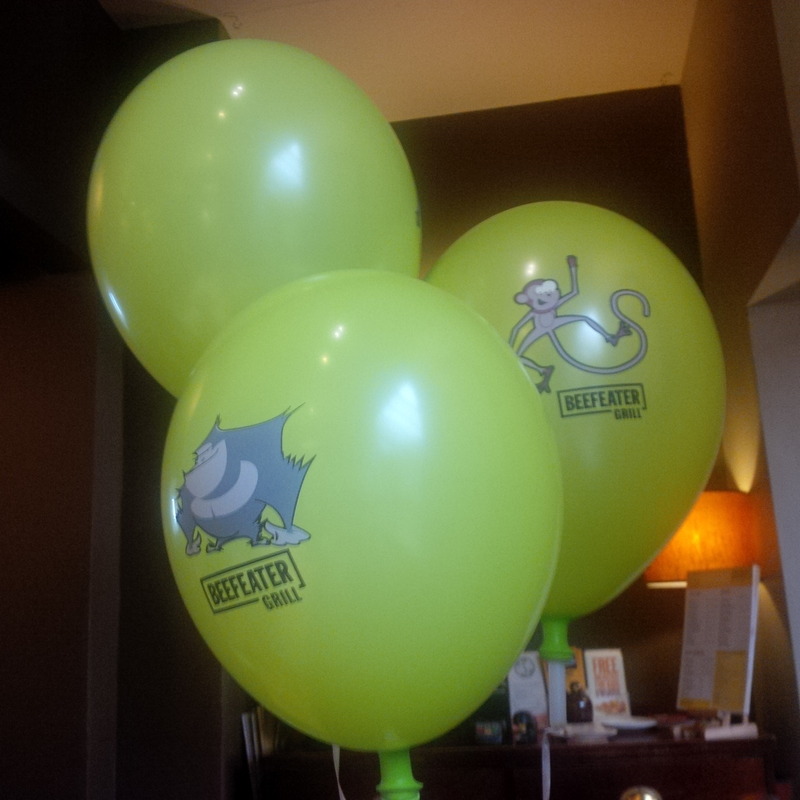 Anyway, today, we dined for a late lunch in our local Beefeater. I don’t allow the girls to freely choose from the menu as they’d always order the same if I did, and it would ALWAYS be pasta! So I chose a few options, prompted them to listen and read them out. You can have chicken breast with chips, peas or beans. Or fish dippers withh chips, peas or beans. Or chicken dippers with chips, peas or beans? Big girl: can I have the chicken, with chips and peas please. Me: with peas or beans? Baby girl: peas please and red sauce. Me: what would you like middle girl? Me: chicken breast, chicken dippers or fish dippers? Middle girl: errrr ………………I’ll have the sausages, mash and peas. My reply was less than therapeutic! Its all ok now, isnt it!? One of the (many) difficulties adopters face is the lack of understanding from friends and families. The people we leaned on for support over the years, that change in job, moving house, end of a relationship, start of a relationship, money worries, health troubles the list goes on, they’ve been there, they’ve understood because usually they’ve been there themselves but suddenly they aren’t able to understand, they’ve never been involved with adoption and only know what they’ve read in the newspaper or snippets from a film. They know nothing of the real, raw, life changing facts of adoption. I met with a friend last night, I met her at Prep Group, we started the adoption process together. We got there first, they followed less than a year later. They live some distance from us, it’s manageable but it’s not ‘pop in for a cuppa whilst passing’ distance, if you know what I mean. Over the last 3 years we’ve met up a few times a year with our husbands, enjoyed some good food and much needed chatter. Organising a time that’s convenient for all, and arranging a babysitter for the chosen date, has always been quite troublesome. Like us, the only real practical support they get is from her parents, but sadly hers live quite a distance away and mine have busy lives of their own. I met with her last night, just her and I. Recently we’ve been leaving our husbands home to babysit so we can meet more regular. We’ve needed too. We’ve needed that opportunity to offload. We head home with a smile, feeling a weight lifted. Aside from our usual rants, moans and outrages, last night we also discussed friend’s and family. Neither of us have seen anyone this holiday (aside from our parents). We’ve spent the entire school holiday, just us and our kids and of course our husbands when they haven’t been at work. Were exhausted. Emotionally drained. Lonely. Fed up. There’s been no over night stays with grandparents or sleep overs with friends, there have been no play dates or outings without us. 24/7 it’s just been us and our traumatised kids. Yes, they’re still traumatised, it didn’t wash off in the bath one day. This got us talking about how we see and hear very little from anyone these days. In those early weeks we may have had the odd phone call, facebook message or text with offers of support and help, if I’m honest, other than my mum, I never had many of those, I guess everyone either figured we needed some space, or that we could cope, I’m not sure, but in general, adopters are supported by friends and family and their struggles understood for at least a few months much like a family with a new baby. But 3 years in, almost everyone seems to have forgotten us. We’ve gone through the worst bit. It didn’t feel like it at the time, but that 1st year was the easiest. We had regular social worker support and the children were so terrified they didn’t dare do anything except please us. Our friend’s were still ‘our friends’ and we hadn’t been consumed by the trauma of our children, and we weren’t in therapy. That was the Honeymoon period. (it’s different for each family, but I think our honeymoon period was about a year). Then things changed, our friends had faded in to the distance, the social workers had vanished, the therapy had started the trauma began to leak. What no one seems to realise is that the more settled the children become, the harder it is. The more boundaries they test, the more they explore their feelings around their past, the more angry they feel, the more loss they feel and the more trauma they offload. And it’s us they offload it onto. If ever there was a time we NEEDED support, some practical help, that time is now. Yet we rarely receive offers of practical help anymore because 3 years down the line we’ve got it covered, haven’t we?! I’ve written this on behalf of adopters out there that feel abandoned, unsupported, and lost not only by the system, but by their friends and family too. Those that have experienced the pressure, the expectations and assumptions from everyone else, that everything is ok, when really it’s not ok, we’re not ok! Today my view has mostly been of this. Baby girl had a lovely 13hours of sleep last night and today she’s been full of laughter and smiles. You know those moments when you doubt yourself, you wonder if actually it’s all just in your head. Are the issues the girls have just a figment of my imagination, a product of my overprotectiveness?? (yes, I made that word up). Well today I had one of those moments. The weather had forced us to change our plans so we decided a trip to the cinema and lunch would be a better idea. Smurfs 2 was on, I remembered an adopter friend warning me about the storyline and how it may trigger some fears in ‘adopted children’ with a history of loss , but I also recalled another adopter telling me they’d been to see it and their child had loved it. ‘maybe it’s me just being over protective’ I thought, ‘it’ll promote resilliance, they’ll be fine, I can’t keep protecting them’ I told myself. I cried at several points in the film, well I fought back tears and lump in my throat I should say. It was a film with a strong storyline line about ‘loss’ ‘identity’ ‘belonging’ ‘being part of a family’. It was also very funny, and we all laughed, a lot. We left the cinema and seated ourselves in the neighbouring Mexican restaurant. I busied myself with menu’s and finding out what everyone was going to eat and drink and ordering our food. Whilst I was sorting out the food order I became aware that baby girl, who was sat beside me, was becoming increasingly hyper. Once I ordered the food I turned to baby girl and suggested she calmed down. She wasn’t able to look at me, her muscles tense, her body flinching, she wasn’t really there. I held her hand and asked her to look at me, I softly stroked her hand and asked her what was the matter, she was wriggly and fidgety and was still unable to look at me. I lifted her chin and looked in to her eyes, she looked sad and scared. I asked her again what was the matter. She cried. She cried a lot, she cuddled me and clung to me and cried some more. ‘I don’t know’ she sobbed. I really could kick myself, I should have known better, I should have trusted my instincts. It was only a few weeks ago that I linked a downturn in the girls behaviour with a different TV channel. We’d change the channel on the TV in the playroom from Cbeebies, which is aimed at toddlers and pre school children, to the channel aimed at children a little older, Cbbc which amongst other things, does have its own ‘news’ feature, which is real life news presented in a easy to understand child friendly manor, but it’s still REAL news with war, death, accidents, fires etc. Their behaviour became increasingly worse, they were constantly bickering, impatient and irritated with each other. We reverted back to Cbeebies after a couple of weeks and the calm descended upon the playroom once more. They don’t need to be reminded that the world around them is scary. For now they just need to feel safe. I may sometimes protect my girls from the world around them, and I may sometimes make choices that seem odd, maybe even controlling, to others, but never again will I doubt myself. 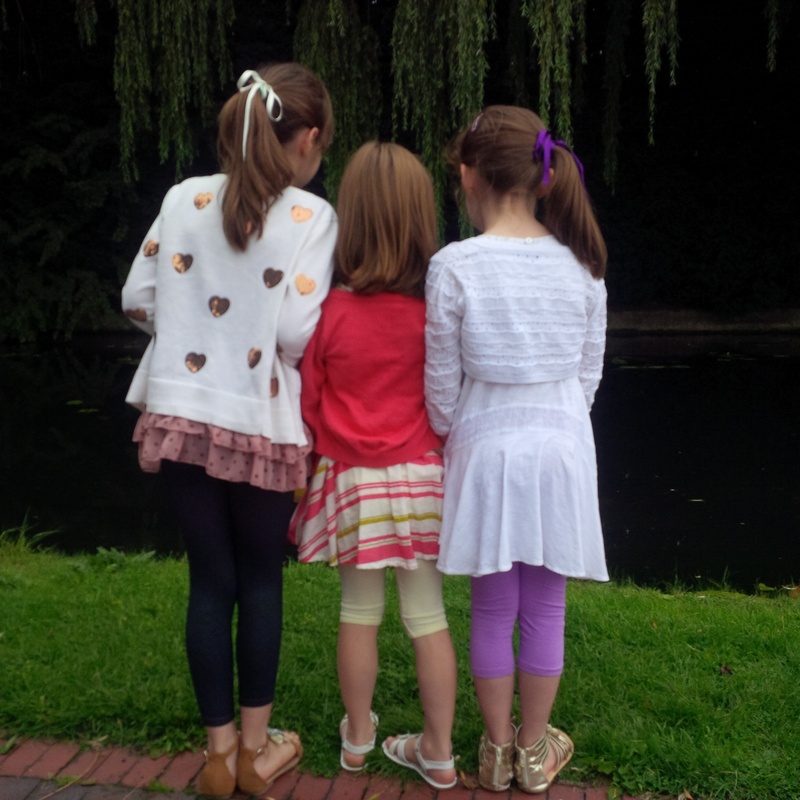 My girls are not emotionally strong enough to cope with the real world and all its diversity. They don’t yet feel safe and secure, they’re not sure who they really are and where they came from, they don’t know why bad things happened to them in the past and I don’t think they always feel like they ‘belong’ anywhere. They smile, they hide, they comply. They rarely show their emotions because it’s just too much, they feel too vulnerable. They still need me to protect them, to wrap them in cotton wool and tell them stories of fairies and princesses and happy ever afters. They don’t need to hear about death, destruction and loss. They’ve felt the real world before, and it was scary. They’ve felt emotions before, they were scary too. When they feel safe and secure they’ll be ready to deal with their complex emotions, they’ll be ready face the world and all its diversitys, and I’ll be ready and waiting to help them. This feels like a good time to tell you about some decisions we’re currently making/considering. We received a letter from camhs, it was kind of a reveiw about their veiws on the last few meetings we’ve had with them. It became clear in this letter that they don’t really understand the girls and they don’t really understand us as a family and our needs. So we’ve had some discussions with the placing authority and have expressed our concerns about CAMHS and how we don’t really feel like the girls are benefitting from seeing them and how we feel that we’re no further along as a family than we were 18 months ago when we first started with CAMHS. So they’ve offered to fund some commissioned therapy and life story work for the girls with an alternative service/therapist. This is great news, this will be someone that will look deep in to the girls past and help them and us, make sense of it and help us to move forward as a family. Perhaps then, they’ll be ready to watch Annie 🙂 or maybe I’m just being optimistic! A few months ago I saw an offer on Groupon for a ToucanBox Activity Set: 3 Months’ Subscription for £29.99. I figured with the school holidays looming and the typical British weather, being typically wet, it seemed like a good idea. So i ordered it, and then forgot about it. A bright and colourful briefcase style box! I placed it on our dining room table without comment. There was lots of looking, touching, poking and finally some asking. ‘Whats in the box mommy’, they said. ‘Your going to have to wait and see’ I replied. They actually loved not knowing, they tried guessing, they talked about it between themselves and asked me a lot. I simply replied with ‘one day in the holidays, we’ll open it, but until then, your just going to have to keep guessing’. It wasn’t long before the rain arrived a couple of weeks later and the box was moved from the table. Excitement filled the air and I tortured them a little longer by slowly and dramatically opening the box before revealing its secrets. Inside there was 4 more boxes and some other bits and bobs. I prompted them to choose a box each and open them. Baby girls box contained everything needed to make a glow worm, that actually glows. Big girls box contained everything needed to make a bug observation jar complete with ventilated lid and magnifying glass. The remaining box conveniently contained everything needed to make the 3 different stages of the butterfly transformation process. The girls were eager to get on with their projects. True to its word, each activity had everything (except scissors and pencil) needed to complete it with really easy to understand instructions to follow. They all thoroughly enjoyed their activities and were very proud of their final creations. They shared the final activity in the remaining box and each made a butterfly to show its different stages of growth. 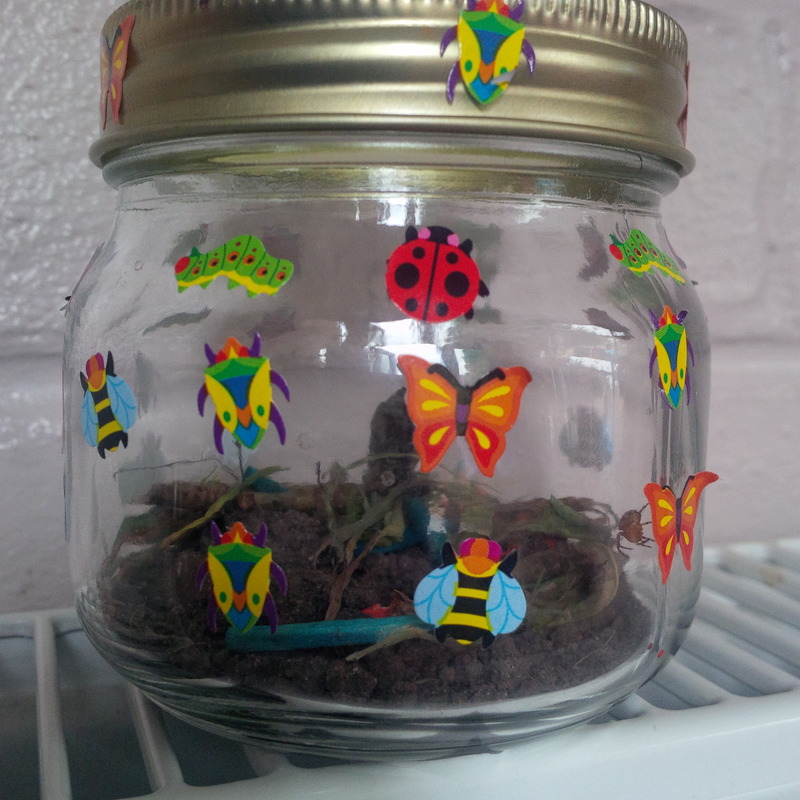 They really enjoyed looking around the garden for a victim bug to torture observe in the bug jar. They set about with binoculars and magnifying glasses to find a beast for the jar. They quickly located and named, ‘Sofia’ the spider and promptly tried to get ‘her’ to sleep by singing Baa Baa Black Sheep to ‘her’. The next box arrived today, Im going to make them wait a while again before we reveal the contents, although I wont deny that I’ve already had a quick peek and it looks super exciting. The next box has a ‘colour’ theme and if you hadn’t guessed the box I’ve blogged about was the ‘Bugs and Minibeasts’ themed box! The boxes are ordinarily, in my opinion, quite expensive, but with this offer our 3 boxes will have worked out to just £10 a box. Taking into consideration the whole experience of having a mysterious parcel arrive and then enjoying its contents, I’d say they are well worth the money and I will definitely be keeping my eyes open for more great offers from ToucanBox. 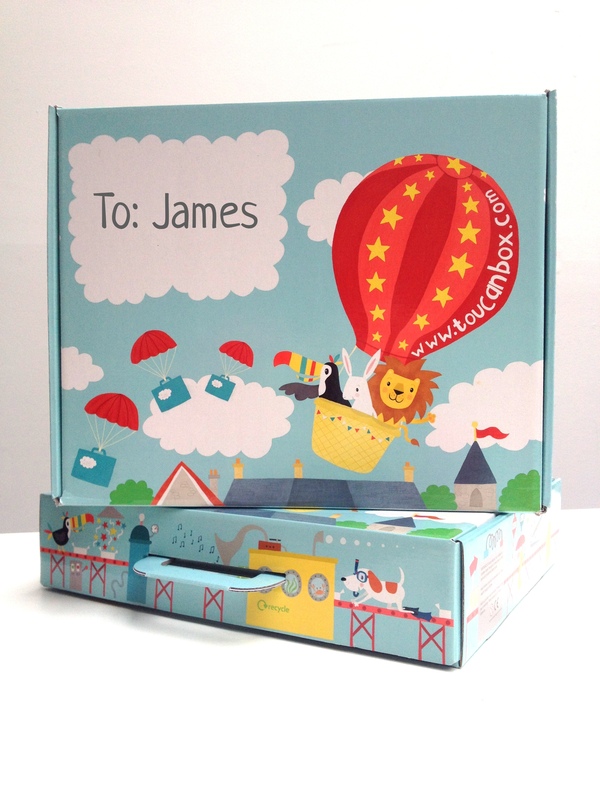 ToucanBox also have a great online blog with lots of free crafting idea’s, take a look here. 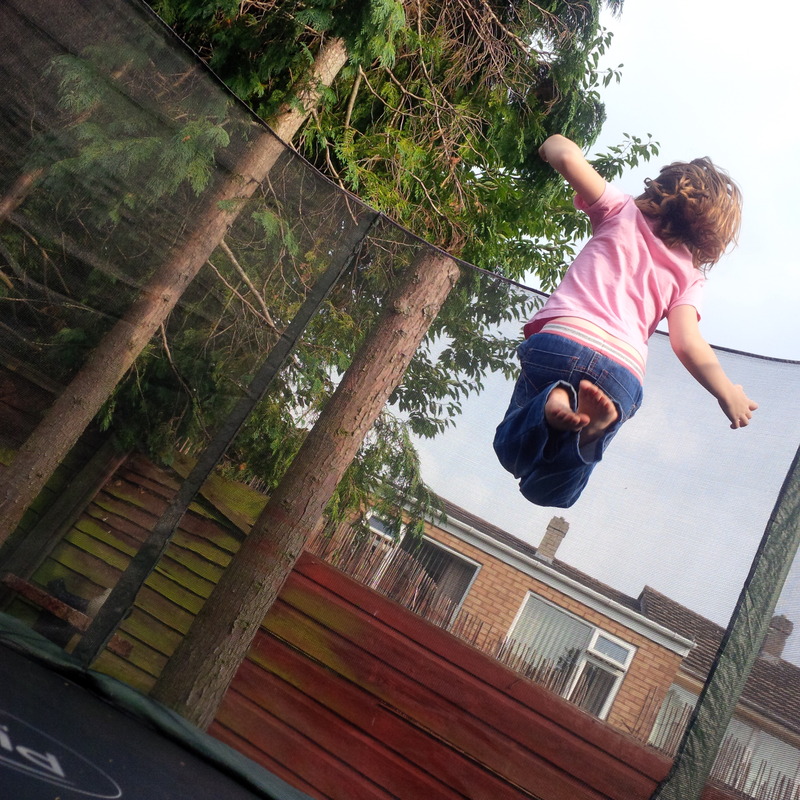 Disclaimer: no bugs were harmed, well aside from being held prisoner and wailed at for a few hours, Sofia was released with only the scars of her mental torture, back into our garden at the end of the day. Baby Girl: Dad are there aliens? Baby Girl: Mommy knows everything I’ll ask her, Mommy can you get Octopus Aliens? That’ll teach me for telling the girls ‘Mummy’s know everything’! Some days I long for a tantrum, some spontaneity, some genuine emotion, some honesty and feeling. The predictability, stability, routine, and calm that fills our days can sometimes be suffocating, (as well as boring). I’m watched, scrutinized, analysed and observed. I’m told the ‘right’ answers,dutifully paid lip service and deprived of the truth, the real, the raw. I’m constantly aware of my own reactions, movements and emotions. I’m forced to quash any sign of ‘craziness’. I’m the mommy that has to spoil too much fun, calm the manic laughter and settle the first signs of over excitement (or face the consequences of over stimulated, over anxious and over tired kids, which isn’t pretty believe me). 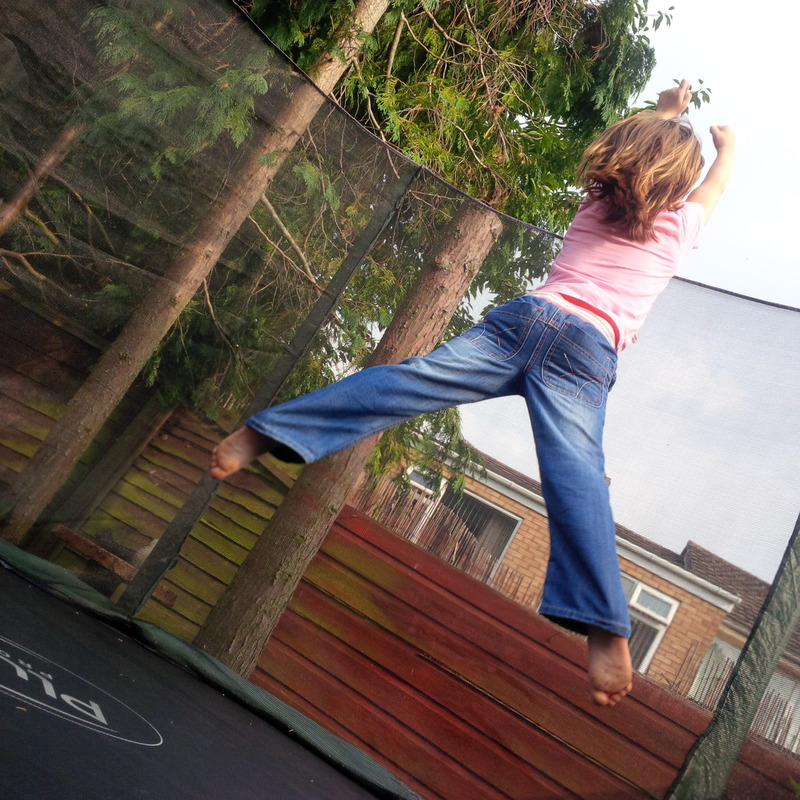 Some days I just want to scream, run outside and shout and jump and bang and be unpredictable, and loud. Some days the idea of a late night party, a last minute road trip or even a midnight cleaning frenzy, beckons me and mocks me, from the distance. Some days I feel like I’m drowning in a still, emotionless desert of nothingness. Some days I loathe the compliance.